One bill, which Senator Jo Comerford and Senator Mark Montigny are co-sponsoring in the Senate as SD 1331, will prohibit political spending by corporations that are owned in significant part by foreign investors. Representatives Josh Cutler and Harold Naughton, Jr. have introduced the House versions of this bill as HD 553 and HD 2535 respectively. This bill builds on Free Speech For People’s work developing similar legislation in St. Petersburg, Florida (along with partners American Promise-Tampa Bay, League of Women Voters of the St. Petersburg Area, and the Leif Nissen Foundation), which passed in November 2017. We gratefully acknowledge the assistance and partnership of Common Cause Massachusetts in helping with the bill to ban political spending by foreign-influenced corporations. The 2016 election showed that foreign interference in our elections is a serious problem. The recent news that at least one Russian company bought political ads on Facebook shows one way that foreign interests can use corporations to influence elections. But Facebook and Twitter aren’t the only way that foreign interests can use American companies to influence U.S. elections. Under current law, it’s illegal for a foreign government or individual to spend money to influence state elections. The Supreme Court has upheld this law. But there’s a loophole in the current law: if a corporation is registered in the United States, but it has significant foreign ownership, it can still spend money, or launder the money through a “super PAC,” to spend it in state and local elections. This bill would help plug that loophole by making it illegal for a company that is owned 5% by foreign owners, or 1% by a single foreign owner, from spending money directly or giving it to a super PAC to spend in state or local elections. This bill will help to limit the influence of political spending from companies owned or influenced by foreign governments, businesses, or individuals in Massachusetts elections, like the 2018 election for governor. Massachusetts used to have contribution limits that would apply to super PACs, but the legislature repealed them. This bill would limit any person’s contributions to a super PAC to $5,000 per year. We need limits on contributions to super PACs to help prevent corruption and the appearance of corruption. Contrary to a common misconception, the Supreme Court’s Citizens United decision does not prevent states from limiting contributions to super PACs. 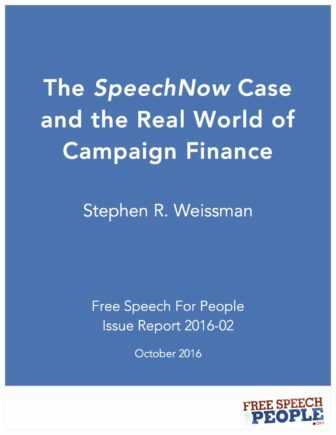 The SpeechNow Case and the Real World of Campaign Finance by Stephen R. Weissman Ph.D. 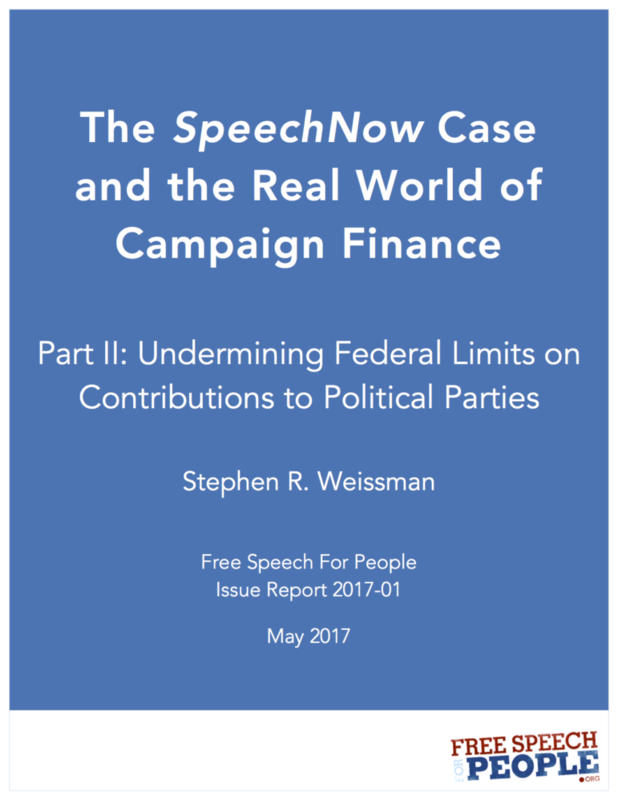 The SpeechNow Case and the Real World of Campaign Finance: Undermining Federal Limits on Contributions to Political Parties Pt. II by Stephen R. Weissman Ph.D. This report explores the top 100 individual and 50 organizational donors to independent groups in the 2012 and 2014 elections. It focuses on those who gave to one or more of the six official national party committees and also contributed to unofficial party-linked Super PACs active in the same election(s). There are federal limits on how much a donor can give to an official party committee per year, but following the SpeechNow ruling, there are no set limits on contributions to party-linked super PACs. For example, in 2014, the maximum a donor could give to a party committee per year was $32,400; assuming a donor who gave to all three committees of one party, that’s $97,200 to party committees. Under federal law, $97,201 would be illegal—too high a risk of quid pro quo corruption—but that same donor can give millions to party-linked super PACs. In essence, donors can multiply their legal direct party contributions by giving to party-linked super PACs at levels far beyond what Congress has determined is necessary (and the Supreme Court has so far upheld) to protect against corruption. This pattern of giving completely undermines the limits on contributions to parties. 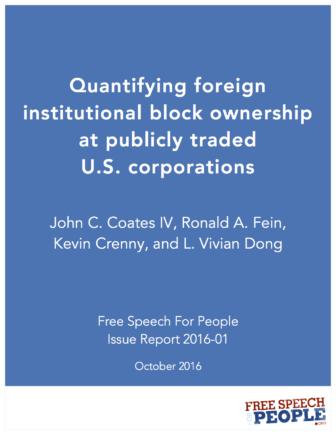 he large donors surveyed in this study made very substantial contributions to their preferred party committees. The size of these contributions, while within legal limits, assured that these donors would be noticed by party fundraisers, many of whom were themselves candidates and elected officials. When these donors simultaneously embellished their financing by massively subsidizing independent Super PACs linked to the same parties in the same elections, they intensified the danger of corruption and its appearance. By ignoring such political realities, the SpeechNow decision has helped undermine federal contribution limits, the primary means of federal regulation of campaign financing. Read testimony in support from scholars in support of our proposed legislation in 2016-17 to limit foreign-influenced corporate spending from Massachusetts elections. We anticipate similar testimony in this session.